Custom lines can be drawn on a map using any number of points that are connected by a line. These can be used to draw lines that follow utility lines or roads but can also be used to customize multi-leg spider charts. If you are using a polyline encoded format, you must add the following to the Feature Options box. 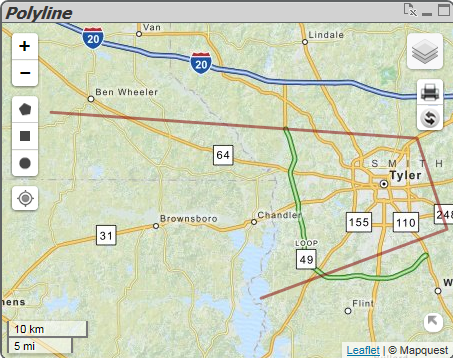 Add a 'Dimension' to the Polygon / Lines properties box of the QlikMaps Polygon / Lines object. There can be as many points as necessary to create a line as long as each set of <Longitude Latitude> points are separated by a comma. Below is a very simple example consisting of 4 points. By default, Polyline colors are randomized. The color can be changed using an expression in the Fill Color Expression box. By default, Polylines are solid. Additional modifications can be made to the line. This will format every line accordingly. An expression can be used to modify each line differently depending on the row it is a part of.